Fish head curry is a very popular dish among Malaysian and Singaporean dish. A typical fish head curry served in a clay pot attracts a wide range of tourist too. The fish that usually used is rohu. But here I am sharing with you a fish head FRY recipe. That too a SALMON head, which is found in fresh water and ocean. 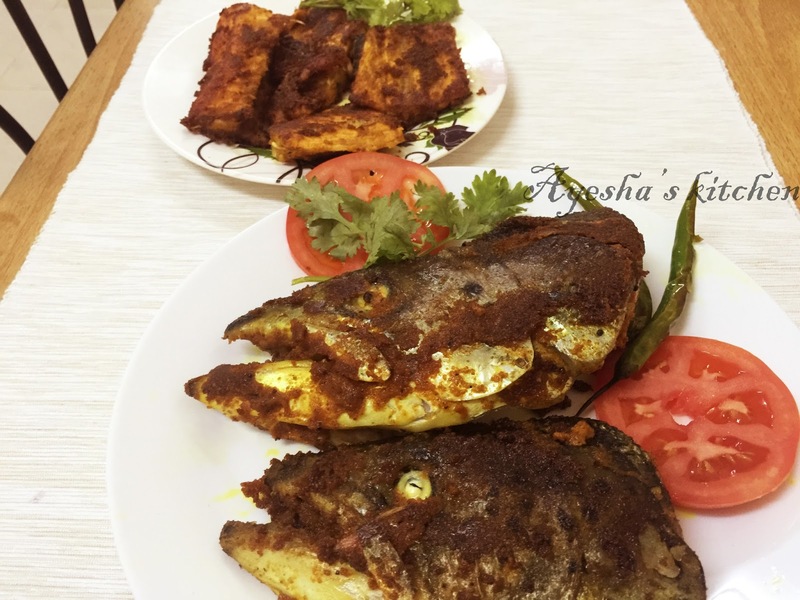 Let us make a recipe of salmon head fry with Kerala masala. Marinate the fish with lemon juice and salt. Keep refrigerated for 30 minutes. Meanwhile make a ground paste of chopped tomato, ginger garlic paste, coriander powder, turmeric powder, chili powder, crushed pepper and salt. The masala should be thick enough. Add 1 tbsp of oil to it (preferably coconut oil). Mix well. Now marinate the fish again with this paste and keep refrigerated for another 30 minutes. And then heat oil in a pan (do not pour more oil). Take each fish and grease it with little rice powder and then fry in the hot oil. Put some curry leaves while frying.